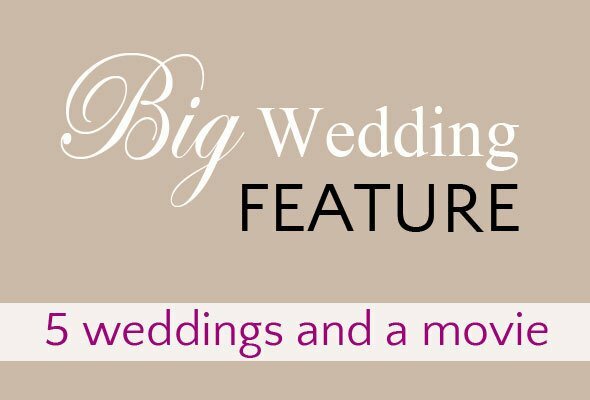 Our team is pretty excited about the new movie The Big Wedding coming in theaters on April 26th, but our reasons are as different as our team is! Some of us love wedding movies, because we never really had a big wedding, for others it reminds of their big wedding day, and some in our team are still single ladies (and a guy) still waiting for their big day. We thought it would be fun to feature our different weddings – all very different, but all with the same happy ending! Read also more about the Big Wedding movie and how to treat your better half or a friend for movies for free. Leigh, our Luxury Travel Editor, had a Southern April wedding that rivaled the pomp and circumstance of British royal weddings on a smaller scale, of course. She and Will married in a downtown cathedral in Raleigh, North Carolina on April 6, 2002 at 12 p.m. And yes, she had those church bells ring 12 times before she made that long walk down the aisle with a 12-feet-Belgium lace veil, which was purchased by her mother-in-law in Belgium in 1961, cascading behind her. Her reception was held in a stately, historic Raleigh landmark, which houses the five-star restaurant, Second-Empire Restaurant and Tavern. Long before William and Kate made it fashionable, guests at Leigh’s reception mingled over Butler-passed canapés. Her monogrammed wedding cake came straight from the pages of Martha Stewart Weddings. Leigh says the entire ceremony went off without a hitch, but 11 years later, it is a complete blur except for one specific wedding memory. Leigh, who is not really a morning person, had to be at her stylist’s salon for her hair and make-up at 6 a.m. She had several cups of coffee to keep her awake, but she certainly did not expect a locked bathroom at the salon with the key accidentally left inside. By the time, her roommate picked her up at 9:30 a.m.; this Southern bride couldn’t get home quickly enough. She left the salon with a veil attached to her head, and one hand holding a shopping bag containing the rest of the 12-feet Belgium lace attached to her wedding veil, and the other hand holding her crotch. That’s not quite how you picture a Southern bride on the morning of her wedding, but at least, she can laugh about it now. Adrienne, our California travel and fashion writer, decided after purchasing a home in Sonoma Valley with her fiancée, to forgo a big wedding in California and elope in Maui instead. The Hawaiian vacation had already been planned for months. It was to be a simple week-long getaway. The day before leaving on the trip, her fiancée Bill suggested half-jokingly, that they elope while in Maui as they had been engaged for a year and a half with no date set. Adrienne jumped at the idea! Once they arrived in Maui and got settled in their rented condo, they got to work on planning their elopement ceremony. Every place they contacted was booked for that Saturday, October 14th. Not surprisingly, they had their pick of places and times for Friday, October 13th. And it was a full moon. Everything was open! Bill and Adrienne, who are not superstitious, had no problem marrying on Friday the 13th. They quickly found a Hawaiian officiant, booked a time at the Kea Lani Hotel in Wailea, applied for a marriage license, bought Adrienne a dress and a bouquet of flowers, and called their jeweler in California to overnight their wedding bands. Aside from their wedding bands being temporarily lost in the mail, everything went smoothly from start to finish. After their ceremony, they checked into the most luxurious hotel on the island, Grand Wailea. They had reserved a garden room, the least expensive available, for one week. When they were told their room was not available, they panicked. The front desk staff gave them a key to another room and told them to come back if they weren’t satisfied with the accommodations. They made their way to the room, passing through a gated-off section of the hotel and went up the elevator to the top floor. Soon they found themselves standing before double doors. They looked at each other in shock and delight. Once they opened the doors they found a gorgeous, plush and enormous room, about 1500 square feet, with a spacious lanai overlooking the Pacific Ocean. It would be their home for the next week; an ocean view luxury suite at a bargain garden room price. Now who says Friday the 13th is an unlucky day? Certainly not Adrienne and Bill! If you have heard Katja’s wedding story before… you know she didn’t really have a wedding. Katja met her husband Matt in Germany, and they are from the other sides of the world. Katja moved to the US four months later and they got engaged immediately. They lived in Alabama, where Matt was attending the US Army flight school at the time, and neither had any family or friends there. So not the romantic wedding story you’d like to hear! 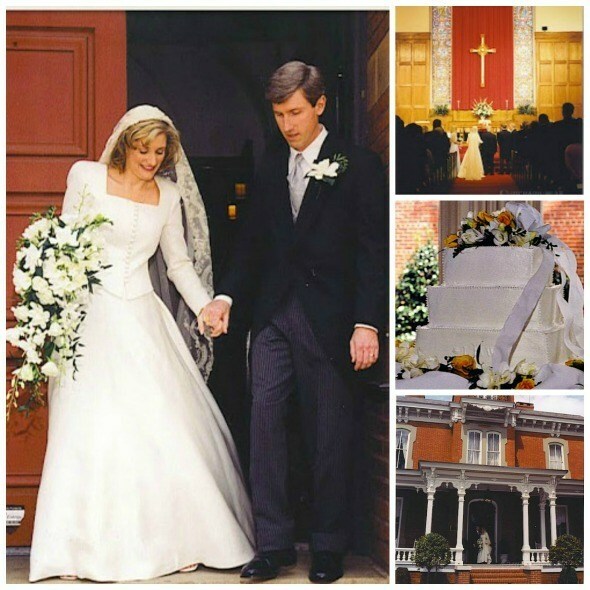 Katja and Matt got married on a lunch break in a court house on July 2nd, 1998 in Enterprise, Alabama. Their witnesses were Matt’s family and his classmates, dressed in army uniforms and green flight suits, reminding of the movie Top Gun – if Maverick had married Charlie, that’s how they would have done it too. The thought made Katja smile on her wedding day – she was a young girl when Top Gun came out and she remembers riding her bicycle home from the movie theater swearing that she’d marry a pilot one day. Some girls dream of the big weddings they see in the movies, Katja just wanted the right pilot to keep her above the clouds the rest of her life. The lace in Katja’s dress? Not heirloom, she bought it from a fabric boutique in Finland and designed her own dress and her mom sewed it. The beach? Not Hawaii, but a long weekend “honeymoon” in Panama City Beach, Florida – with the new in-laws! The wedding photos? Taken in Austin, Texas later that year, and they wore an evening gown and dress uniform to celebrate Matt’s “wings” from the flight school. 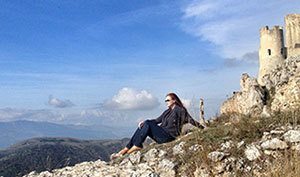 When friends and family heard that Satu, our Adventure Travel Editor was planning to get married in Slovenia, they immediately thought that she, a Finn, and her British husband wanted to get married in a “mutual ground”. But no, the main reason was that they wanted to give everyone little taste of the outdoor life they enjoy, whether it was rafting, kayaking, climbing, biking or hiking. And for those that really wanted some city life, shopping in Venice and Ljublana wasn’t far either. Looking back, Satu remarks that the day couldn’t have been any better. The weather was amazing, the food which was organised by their local friends who own a fine-dine restaurant was fabulous, and most importantly many of their close friends and family had been able to make the journey to join their special day. “I want to get married again, to the same man and in the same place” she says. Reeta and her Spanish husband Bruno had planned to get married for years, but the one time they had booked a date and venue, her cousin had booked the same day, so Reeta cancelled hers. She was determined to get married before they had children, so they sort of did in the end – two months before their first daughter was born! The whole event was planned in nine days, and was a small one. 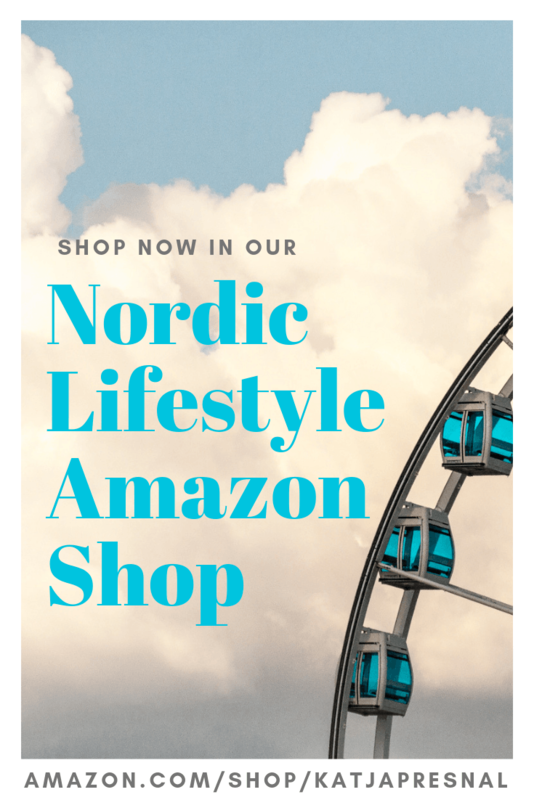 Reeta was working in England and her husband-to-be in Denmark at the time, and they flew in a day before the wedding back to her native country Finland. The required wedding certificate had been lost in the mail, so they weren’t even sure if the whole was going to happen or not until hours before the big event! 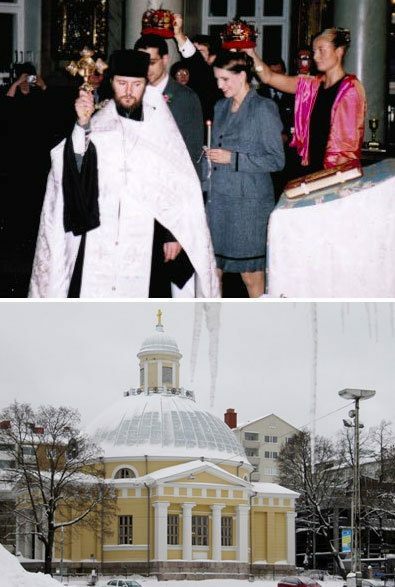 The wedding took place in December 2004 in the Greek Orthodox cathedral in Turku, Western Finland, and the wedding couple wore grey (perfectly matching to the weather): Reeta had bought her maternity outfit in Chicago in a recent business trip, and the groom wore almost matching light summer suit from Armani – not quite what she had dreamed of. Her fingers got swollen from the flight and the ring didn’t fit on; and truth be told she only started to wear it last year after getting it re-sized as her fingers never recovered! The happy couple didn’t have time to book a wedding photographer, so the groom’s father took (very few) photos and they honeymoon is still waiting to happen – hopefully in French Polynesia in the near future. This was certainly a very unusual affair and a day to be remembered! With an all-star cast led by Robert DeNiro, Katherine Heigl, Diane Keaton, Amanda Seyfried, Topher Grace, with Susan Sarandon and Robin Williams, THE BIG WEDDING is an uproarious romantic comedy about a charmingly modern family trying to survive a weekend wedding celebration that has the potential to become a full blown family fiasco. In theaters on April 26th. When you buy your tickets now to BUY ONE GET ONE FREE – movies and weddings are always more fun with a plus one! 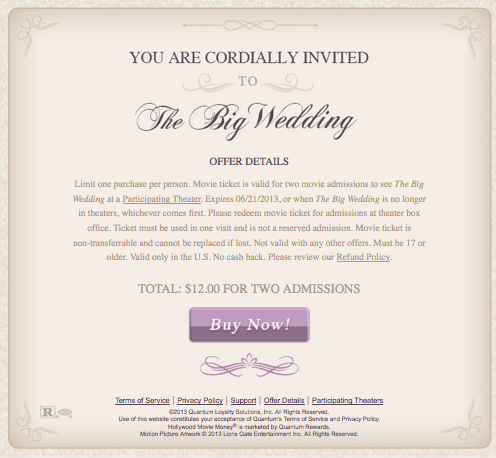 Get two tickets to see the Big Wedding for $12 at The Big Wedding movie official website. Love this! I love wedding stories because they are always so unique. Fascinating stories, Katja. Love this. Thanks – once we started talking about our different weddings, I knew we had to collect them under one post!! All so different!